Short and sweet today – after all it IS Super Bowl Sunday, and I’m pretty sure 99.9% of my readers are much more interested in watching the game (or enjoying the party) than in reading a blog! But – for the other .1%, here’s what I’ve got for you this week! 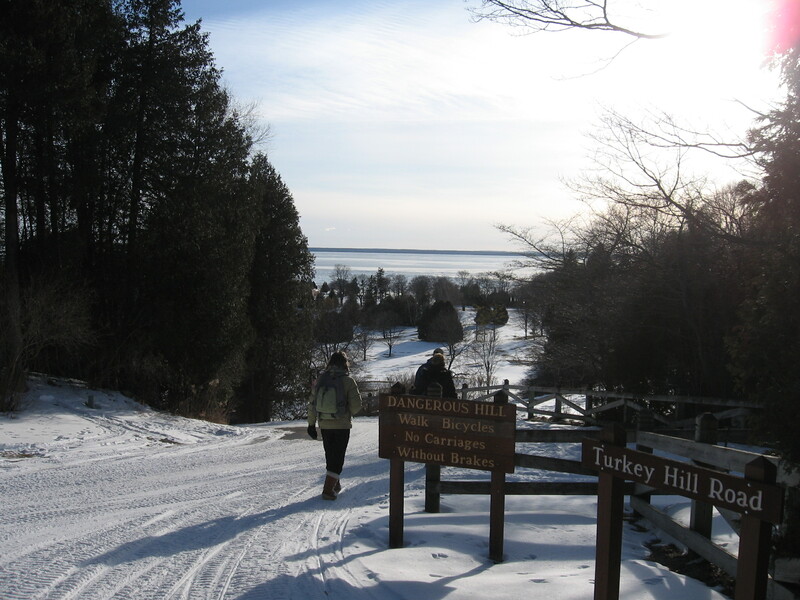 It was the PERFECT weekend for the Winter Festival on Mackinac Island – lots of snow (inches and inches of the stuff), cold weather to keep it from melting, and sunny days filled with blue, blue skies. Friends Jeff and Patrick and their friends Ellyce and Danielle flew over to enjoy all the fun, and here are three of their pics from the weekend. Snow dragon! James Barch created this amazing sculpture in his yard on the Island. This talented young man also creates beautiful pottery. 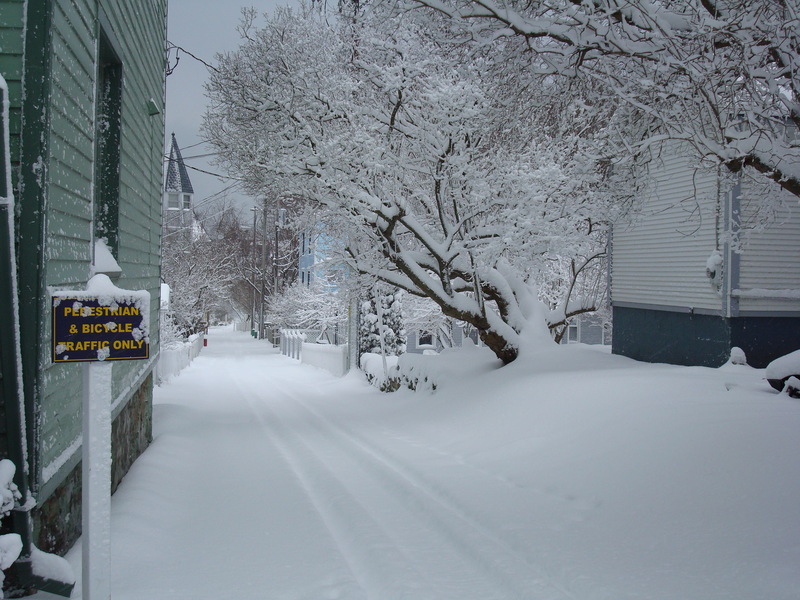 What a spectacularly beautiful place Mackinac Island is – and never more beautiful than when covered with several feet of white, unspoiled-by-motor-vehicles snow. After a slow start to winter, Mother Nature is sure going out of her way to provide plenty of the white stuff lately, and I know Island friends are so thankful. Below is the link to an awesome video of Saturday at the Winter Festival created by Travis Sredzinski, who is spending his first winter on the island, although he’s been a summer and fall worker for several years. The sound is choppy on my laptop, but I’m hoping it’s not that way on yours. If it is, and it’s annoying to you, just do what I did – turn off the sound! You don’t need sound to enjoy this video – believe me! Have a great week, and God bless each and every one! 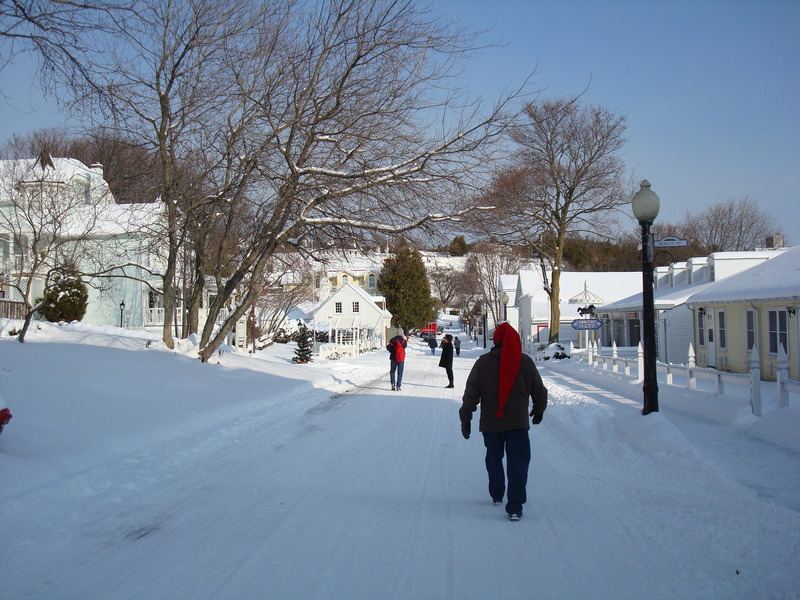 The Winter Festival on Mackinac Island was this weekend, and I’ve been thinking about it a lot today. Thanks to Greg Main, I even have a video I’ll share with you of a broom hockey game on Saturday. There is a LOT more snow than last year when we were there, and this year the ice bridge is open (it never formed last year at all). I would have given anything for a ride across Lake Huron on the Ice Bridge. But, it just wasn’t in the cards for us last year, and this year none of us could make the trip. But – there’s always NEXT year! A newsletter from Greg Main is full of news: “It’s hard to believe January is another turned page on the calendar. As of the time I’m typing this, we missed yet another snow storm (only a few flurries in the air), but the cold air continues to blanket this area, which is good for the ice bridge. At the time I last emailed everyone, I was unaware that 4 people had already crossed to the mainland and back which is all that’s needed to open the floodgates. The ‘bridge’ formed remarkably quick this year, what with the ferry stopping service on Tuesday, the 11th, and people crossing by Sunday, the 16th. I’ve yet had a reason to cross, but all of the reports I’m hearing from those who have made round trips is this is one of the best (as far as being smooth) crossings in a long, long time. So far, the bridge this year connects with the island at the end of the boardwalk. During one of the few times I’ve been able to take advantage of the sun-filled days we’ve had recently and plan a long walking outing, I wandered out from the boardwalk to the third tree which has been ‘planted’ in the ice, marking the initial route, in order to take some photos of various things and angles and such. 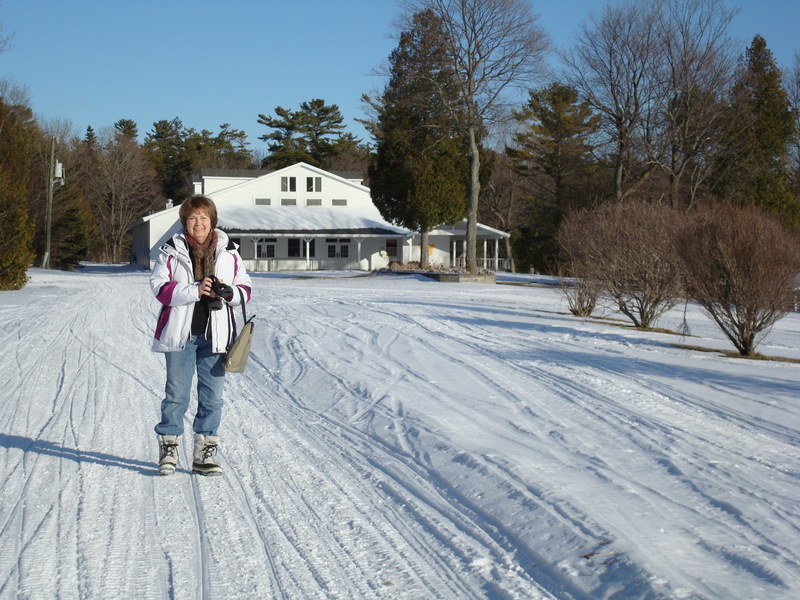 I’ve done this almost every year we’ve had crossable ice and, if memory serves me correctly, whenever snowmobiles would pass by as I’m on the ice – in years past – I could always hear the dull thud of the ice cracking somewhere nearby. It’s a given. When out on the ice this past Sunday however, with numerous snowmobiles passing in both directions, not once did I hear or feel anything in the way of the ice being stressed. I can only consider this to be a good indication of a very solid surface out there right now. It formed so rapidly this year and with frigid temperatures being so abundant for most of the last three weeks, it’s no wonder the ‘bridge’ is so solid . . . . for now at least. This early formation of crossable ice has brought good business to the island every weekend so far. Dozens of mainlanders have ventured over, bringing with them a welcome infusion of business. One last note on the cold air of late. It’s amazing how we become accustomed to it after a few days to the point that the 22 degrees we experienced early Monday morning, almost felt balmy. I finally strapped on the skis a week ago today and despite the lack of snow, those trails which could be groomed were in excellent shape, and the skiing was fantastic. I never get tired of being the only one (seemingly) out on the trails, enjoying the opportunity to combine the exhilaration of a cardio workout with the absolute quiet and tranquility I often find while traversing the myriad trials of the island’s interior. The amount of daylight is rapidly increasing, which adds a bit of hope that the coldest days will soon (hopefully) be behind us. In a normal year, we don’t see consistent high temperatures around 30 until the end of this month anyway, but the simple addition of a few minutes of sun each week helps pass the winter months. I’m told that the owner’s of the Mustang Lounge have signed papers today, buying Patrick Sinclair’s Irish Pub. This rumor has been around for about a week or more, but I’m told it’s official, as of today. Sunday was a great day to be out walking. 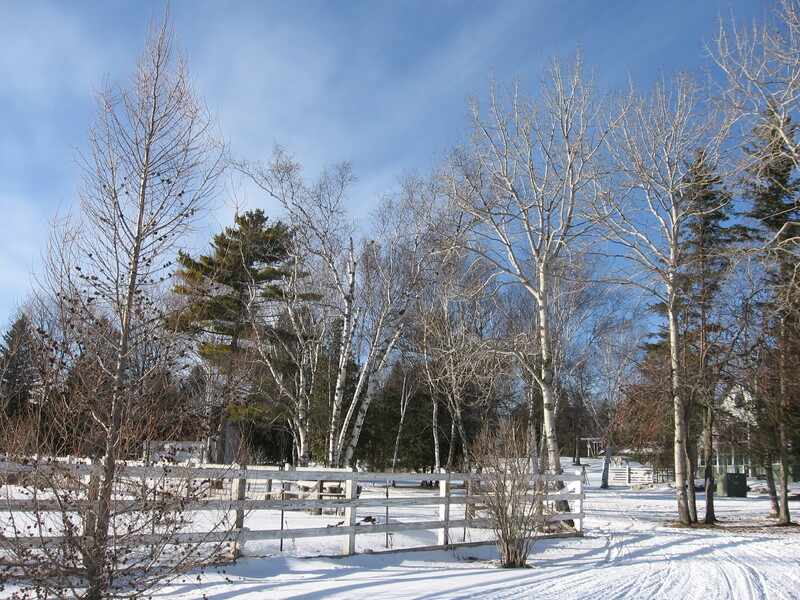 Although it was only 14 degrees, barely a whisper of wind and ample sunshine made for a fantastic winter day. Just as I was reaching for my jacket, I heard a noise on the deck just outside the bedroom window. Parting the curtain, to my surprise, a mere 15 feet away was a coyote! Carefully closing the curtain, I raced for my camera which sits by the entrance door, only to catch a glimpse of gray and brown fur running past the window in that room. Too late to get a photo, I quickly opened the door to see it bound across the street and up the rise into Marvin May’s back yard, disappearing from sight. After finishing dressing for my walk, I traced the tracks as far as Marvin’s yard, took some photos for posterity, then headed north along the boardwalk, destination: Humbard’s Hill. As I reached the end of the boardwalk, several snowmobilers had gathered as four of them lined up in drag racing formation. After watching three races in which the same person won every time, I continued on along the shore road. But for the far-off sound of machines on the ice, there was no noise other than the snow crunching under foot. At one point, I came across another spring (several, actually, in the same spot), and I stopped to video what I believe is another of those natural wonders which most people would simply overlook were it not for the glaring way it was noticeable at this time of year – much like the way a hare turns white far before snow begins falling. With this spring, if not for the snow surrounding this open water on the beach, as if highlighting it, saying, ‘look at me’, it would not qualify more than a quick glance. I enjoy ‘finding’ these types of things on Mackinac no matter the season but it’s more satisfying in a way to come across them during the quiet season. The rest of my walk was as expected with nothing more out of the usual to catch my attention. 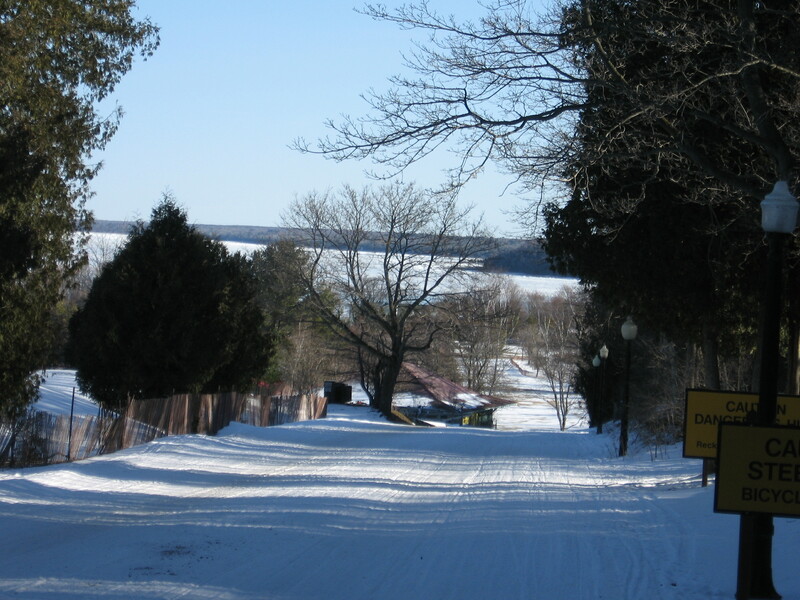 I climbed Humbard’s Hill, spent some time overlooking the Straits at Sunset Rock, watching the tiny specks in the shape of snowmobilers zipping back and forth far off and far below, continuing on across the Stonecliffe property, following the road the Hubbard’s Annex, circling the commons area to be reminded of the numerous times I trimmed Audry Gallery’s hedge, now capped with snow which, from a distance, looked like a thick, white, cake frosting, dripping down over the sides. Stepping on to Pontiac’s Trail next to the Straus’ cottage, I followed the West Bluff road, past the front of the Grand Hotel, to Cadotte, then home. No sooner did I get undressed for the evening (so I thought) when a certificate for a Village Inn pizza, hanging on the refrigerator door, caught my eye. Good idea. Re-dressing for a walk down there, I was almost out the door when Steve Cotton called to tell me a plane had landed on the ice right off the end of Market Street. With camera in hand, as I reached the sidewalk in front of the house, the plane was in plain sight, directly down the hill, on the ice. 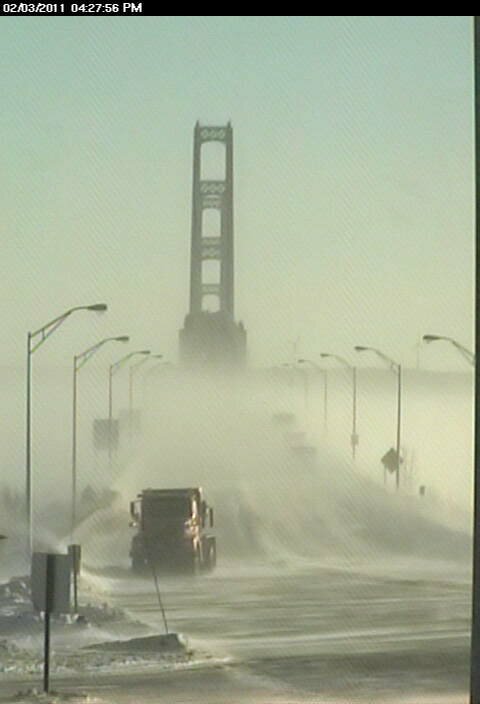 A bridge cam shot during some wild and blustery winter weather a few days ago. “Take a ferry or fly directly into the island for an experience of a lifetime. Personal vehicles are prohibited on the island, so bust out your walking shoes or your bicycle. Experience nature at its finest by riding around the island, or walk the streets and visit the small local shops and eateries. If you’re not completely worn out by the end of the day, you are doing something wrong.” Other locations mentioned in the article were Las Vegas, NV, Catalina Island, Royal Canadian Cruises, Keystone, CO, and Acapulco, Mexico. 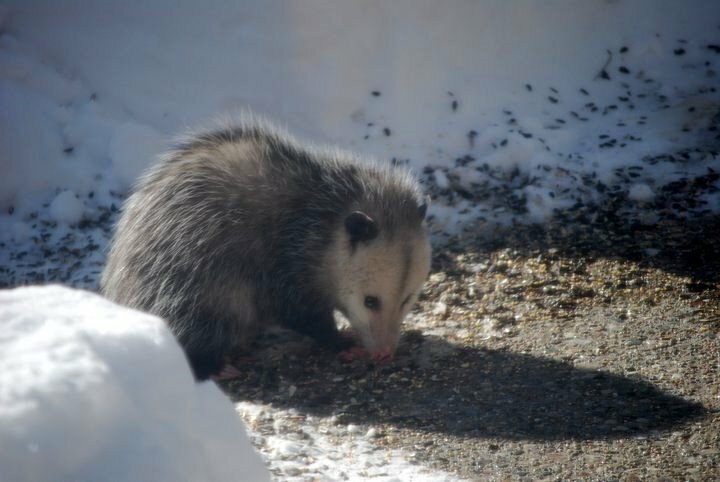 My friend Mary, who lives in Grand Haven, Michigan during the winter sent this precious photo of a possum that has been visiting her birdfeeder for about a week. He’s almost the same color as all that snow they’ve been getting. In our yard in south Georgia, this cutie would have to compete with the squirrels for that seed! Our friend and neighbor on the island, Smi Horn, posted some beautiful photos this week on his Facebook page, and said “ok” when I asked if I could share them. Smi is such a good photographer! 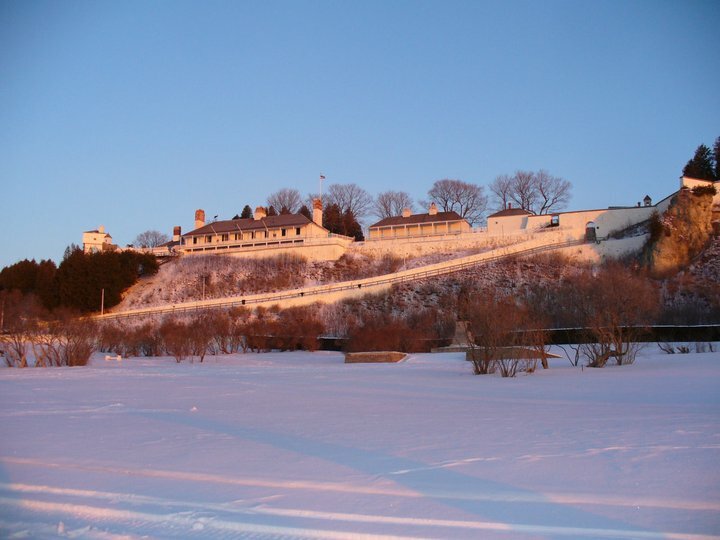 Fort Mackinac - in all its winter beauty. Sunrise and the East Bluff. 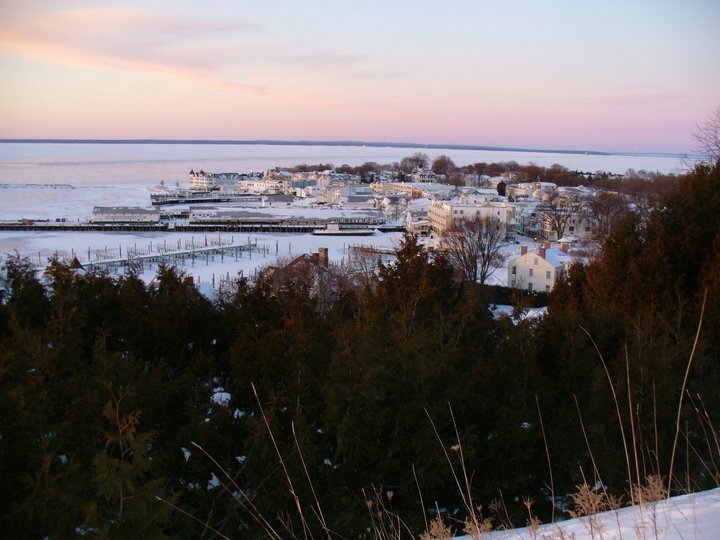 The town of Mackinac Island - surrounded by ice and blanketed by snow. 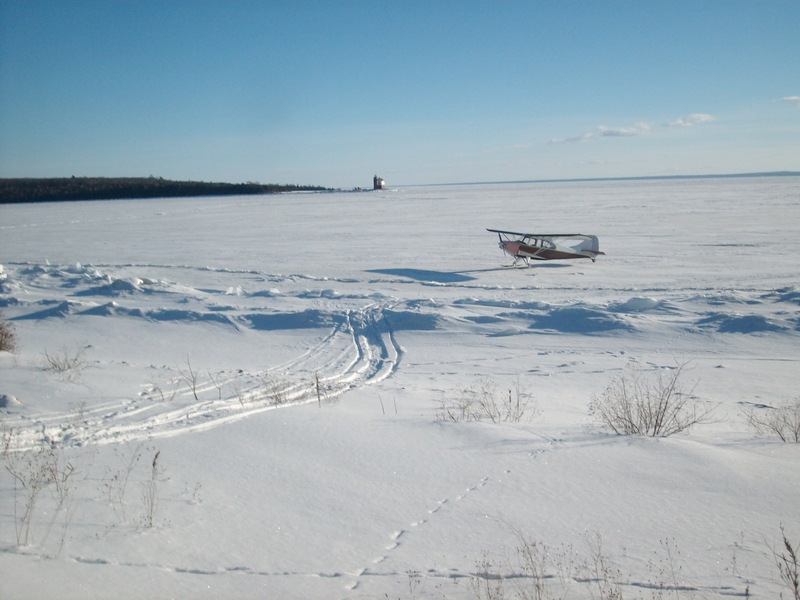 My buddy Greg Main sent this great photo of the plane that landed on the ice this week. Greg talks about the plane landing in the newsletter posted above. For a video of the plane taking off for its trip back to St. Ignace, you can click here: http://www.youtube.com/watch?v=5WrvnVEwvgU. I’ll close this week’s update with this great video from Greg Main of a broom hockey game on Saturday at the Winter Fest. This was a group of young adults, and as you will see, you have to sometimes make do with slightly defective equipment! http://www.youtube.com/watch?feature=player_profilepage&v=OECiBMYBpHM. Hope everyone is doing well and surviving all the crazy weather this winter. We were in Atlanta this weekend to see Blake one more time before he moves out to Colorado next week. We hate to see him go so far, but relatively speaking, it’s a heck of a lot closer than China, where he’s lived for the last four years. He’s very excited about his new job! Blake and I in Atlanta yesterday at Jason and Blair's house (that's their wedding photo on the mantel). 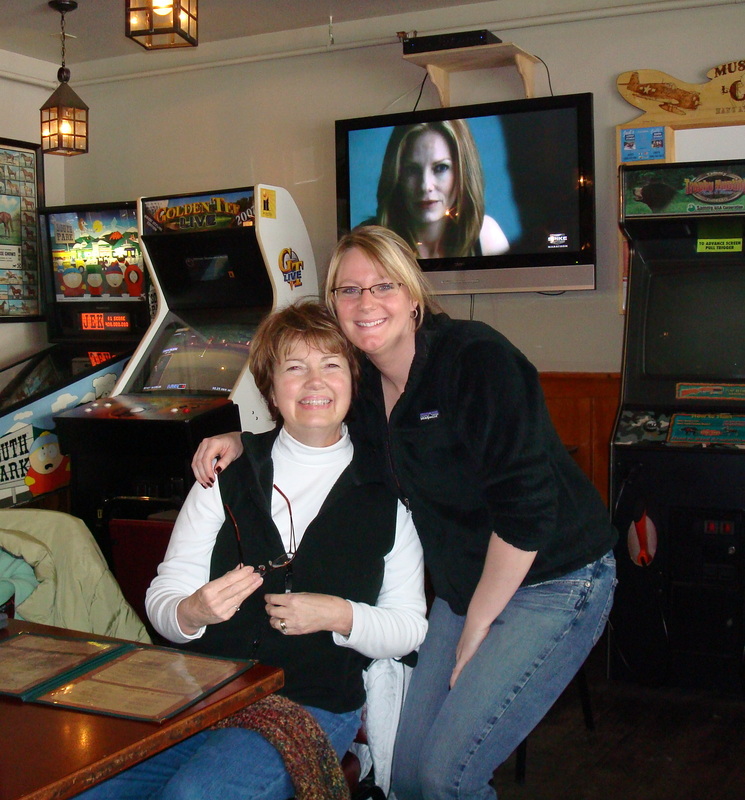 Personal Note: Those of you who were reading this blog a year ago remember that it was at the end Winter Festival 2010 that our friend Don lost his wife Karen and his sister-in-law in a tragic snowmobile accident on the island. My thoughts and prayers have been with Don and his family all weekend, and I ask that you remember them in your prayers today. 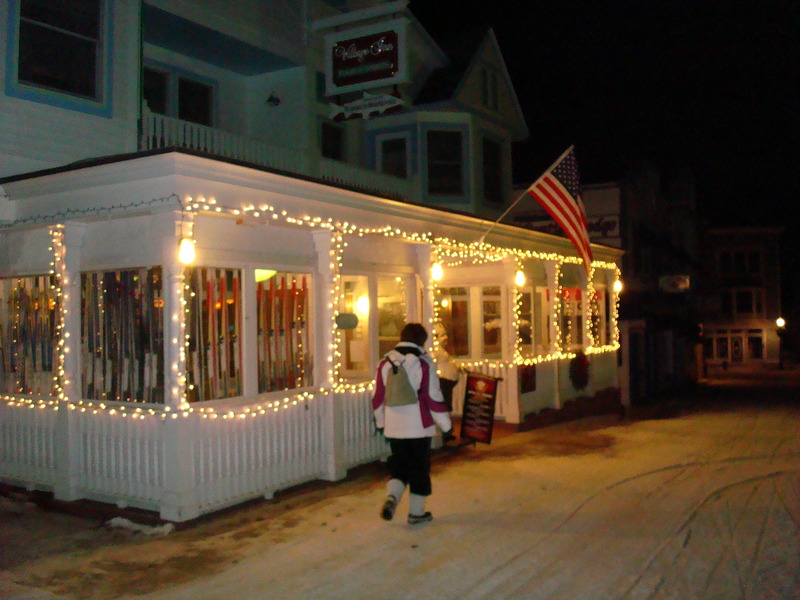 FRIDAY NIGHT BASKETBALL ON MACKINAC ISLAND – JANUARY 29, 2010 – HEAR IT LIVE!!! Chris West (Mackinac Island Tourism Bureau) & Dave Johnson are set to Broadcast LIVE the Mackinac Island Lakers Basketball Game TONIGHT (Friday, January 29) @ 6 pm. After the game, there is a Homecoming Dance at the Village Inn, and Chris and Dave are DJing the dance. Maybe they’ll stay on the air! www.radiomackinac.org. January 25: Tim had a good day on Monday. Fairly flat terrain and then a 1,000 to 1,500 climb. There was a stretch of 10 to 20 miles where the road narrowed, and there was a lot of Monday morning traffic, glass on the road, and no shoulder. One more flat (makes number 17). Tim was able to pick pecans without getting off his bike as they were hanging over the road – obviously a big money crop there in New Mexico and Texas. There is a possibility he’ll be on the radio again this week at a radion station in Marfa, TX. Fort Hancock, TX for the night. January 26: Tim is inVan Horn, TX. Tuesday was another good day, sunny, a slight head wind, and the roads were car free. He was on Route 10 for about 15 miles. Tim said he saw the prettiest sunset of his trip so far, just about as beautiful as those in northern Michigan. He did get his 18th flat tire, just as he was getting into town – thought maybe he would make a whole day without one. Tim said the desk clerk was very helpful and nice, and they have a computer he can access! He’s going to check out the posts and his facebook page. Early to bed as tomorrow is a rough day, 91 miles and a 3,000 foot climb. 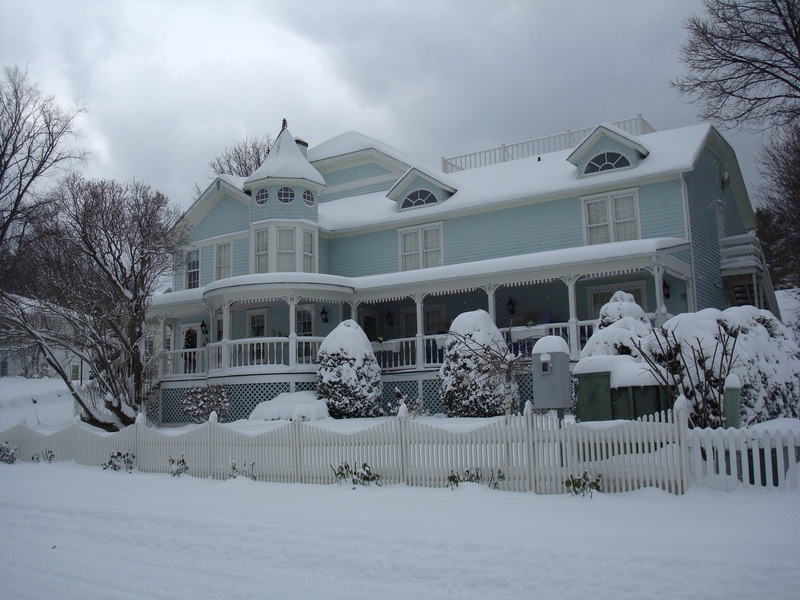 For five days this coming week there is a 50% or more chance of snow on Mackinac Island. That’s a very good thing, because right now what little snow is left is slowly being turned into slush by rain. Come on snow! 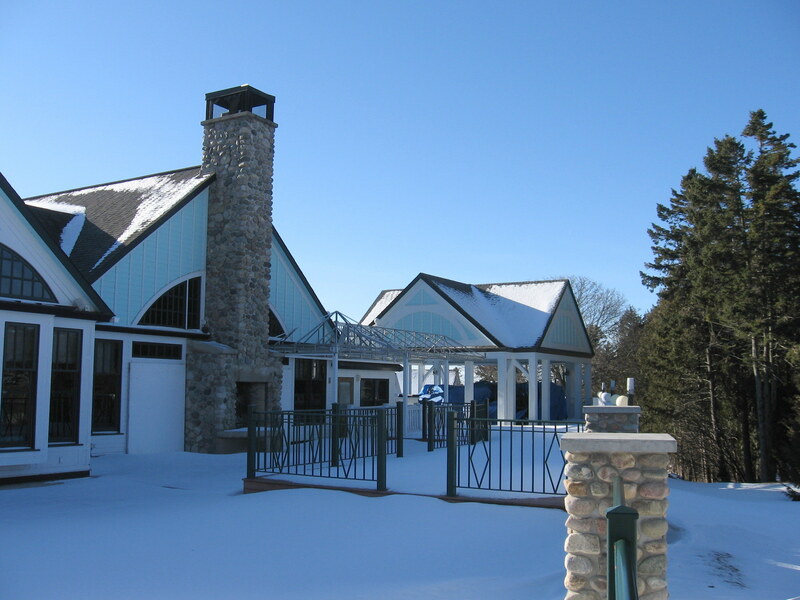 We are hoping for a winter wonderland when we arrive on February 4th! We have the schedule of events for the winter festival, and I have posted it below. There is still time to make reservations on the island and join us for a few days of fun. 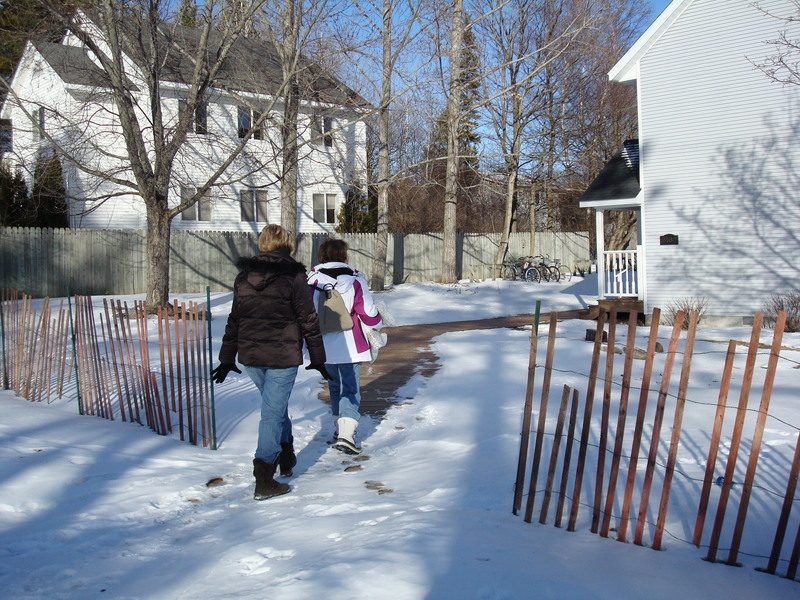 Rooms are available at Bogan Street Inn, the Cottage Inn, and Pontiac Lodge. This week highs are supposed to be in the teens, and lows will hover in the single digits. No word yet for the next week – when we will arrive – but it’s beginning to look like we might actually get to wear all that cold weather gear we bought! 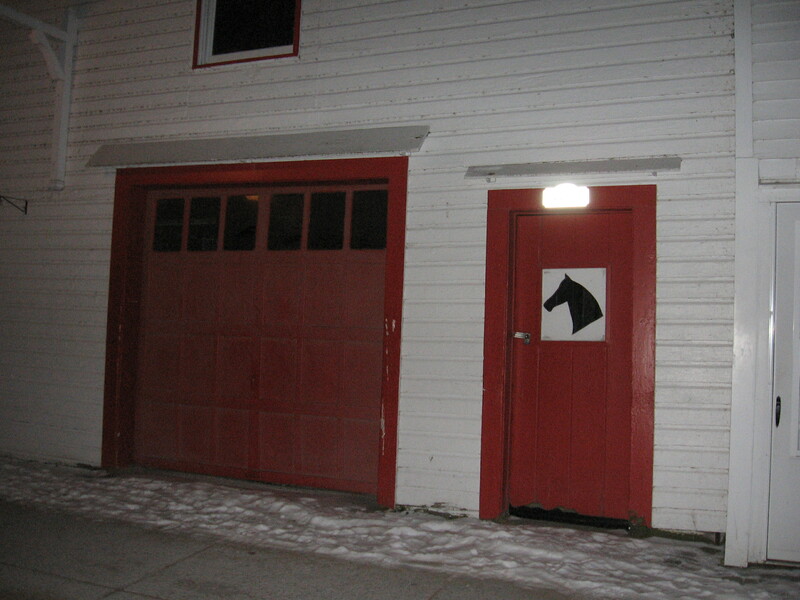 There are 12 horses working on the island this winter. They are all strong, calm, and good-natured. They have the ability to pull heavy loads uphill in ice and snow, and they hardly notice the snowmobiles or the snowplow. These are mostly Belgians and Percheron crossbred working horses. They transport people and deliver mail, groceries, building materials, and supplies to the more than 300 year-round Island residents and the handful of businesses that remain open. The only time they are taken off-duty is in severe weather, especially during hail. The “best of the best” horses on the Island are the dray horses. They must be able to stand in one spot while the dray is unloaded, while ignoring snowmobiles. The horses wear special shoes to give them more traction in ice and snow. The steel shoe has metal spikes to grip the road. The shoes are changed about every five weeks. 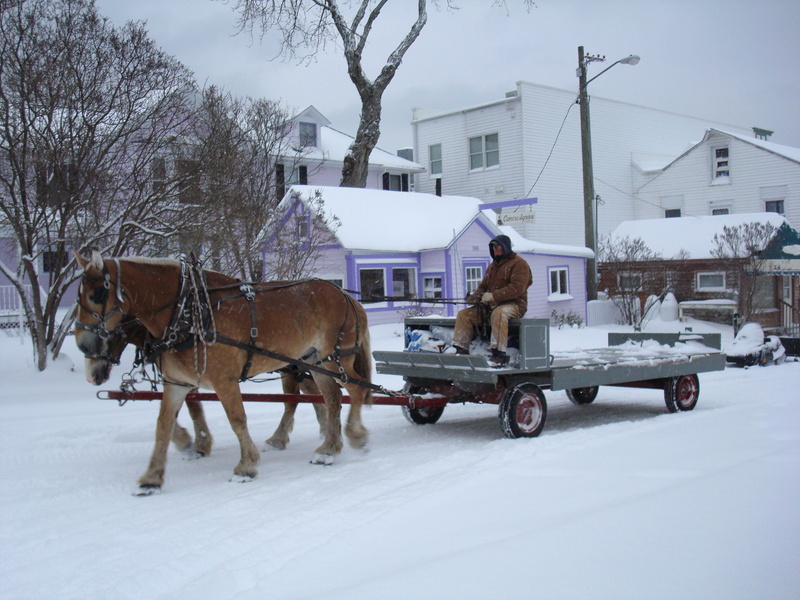 The Mackinac Island Service Company tests horses all year to determine which would work best during the winter. Usually they keep the same horses year after year. If a horse is young when he proves himself to be a good winter horse, he may work on the island 15 or more years. The horses’ day begins at 5:30 a.m. when George Wellington arrives at the barn and gives them fresh hay, grain, and water. The dray drivers arrive at the barn around 7 a.m. to groom their team. 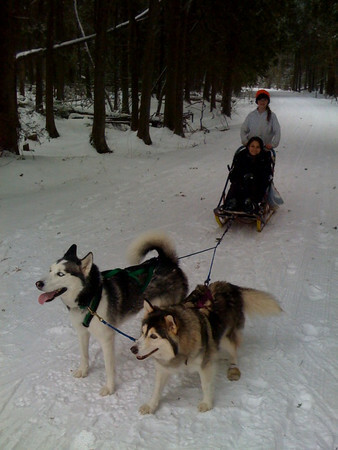 In the winter they are brushed, cleaned, and then harnessed. Even if packages or building material arrives that needs to be delivered far from town, everything is delivered by dray. It would be much easier to just throw everything on a snowmobile, but the island tries to remain true to itself. 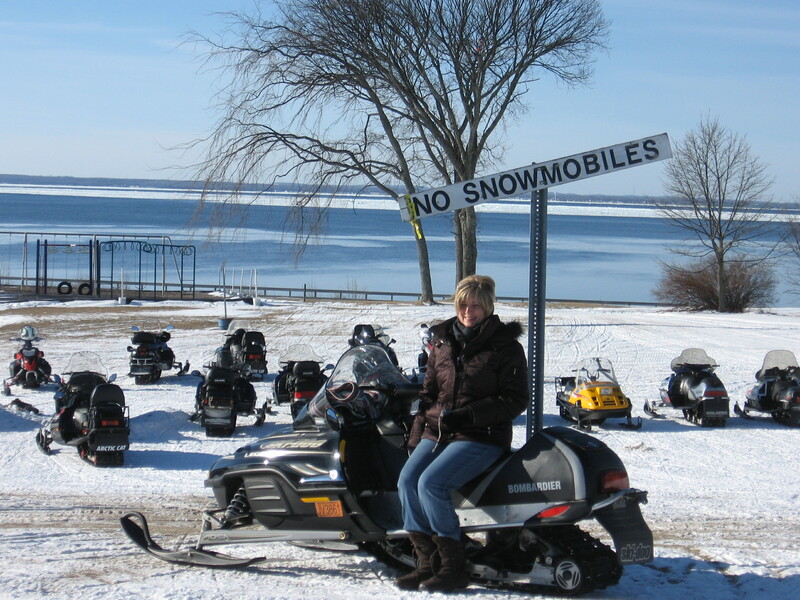 Snowmobiles are supposed to be for personal use only. Around noon on the freight dock, the horses are given oats, grain, and water for lunch. After the last freight is unloaded and delivered, the horses head up Cadotte Ave. and back to the barn in Harrisonville. Their harnesses are removed and they are brought to their stalls, where they are fed grain, oats, and water. January 21: Tim spent the night in Hillsboro, NM, after leaving Silver City in the snow. At one point he had to walk his bike six miles because the snow was so deep. When he arrived in Hillsboro, everything was closed. He went to a local B&B, and the owner refused to rent him a room, saying she was going to town and didn’t want anybody there. She told him there was a cinderblock bathroom down the road, he could sleep there for the night. Tim then went to the post office, where he met a lady named Mary. Mary called the people who owned the local motel, and they opened it up and gave him a room, even bringing him food and drink because everything else was closed. January 22: Tim arrived in Hatch, NM, after a day of riding in rain, hail and wind so strong it pushed him backwards if he stopped. Even though he was traveling downhill, he had to keep pedaling the entire time. January 23: Tim made good time to Las Cruces, so decided to go on to Anthony. The winds were around 20 mph, gusting to 40 or 50. The sun was shining, the mountains were snow covered and beautiful, and he passed acre after acre of pecan groves. Going the extra miles to Anthony will give him a short 50-mile trip to El Paso on Sunday. A friend has arranged for Tim to use his La Quinta points for his room in El Paso. January 24: Tim made the short ride to El Paso, and got the day off to rest, recoup and watch the football playoffs. He took a photo at the Texas border. Mike Forrester sent me a couple of YouTube videos of our transportation to the Island from St. Ignace. These are really neat, with some great scenery. One is taking off from St. Ignace, and the other landing on the Island. We both think these were taken this year, probably very recently. That’s all for today’s update. I’m posting a few more pics of the Island as it was in December. These are all Jill’s pictures, as is the one in the header and the one with the horse story. Will continue to post updates from Tim, so check back every few days. See you next Sunday, good Lord willing. God bless. I love the hat this guy has on. Wonder where he got it! 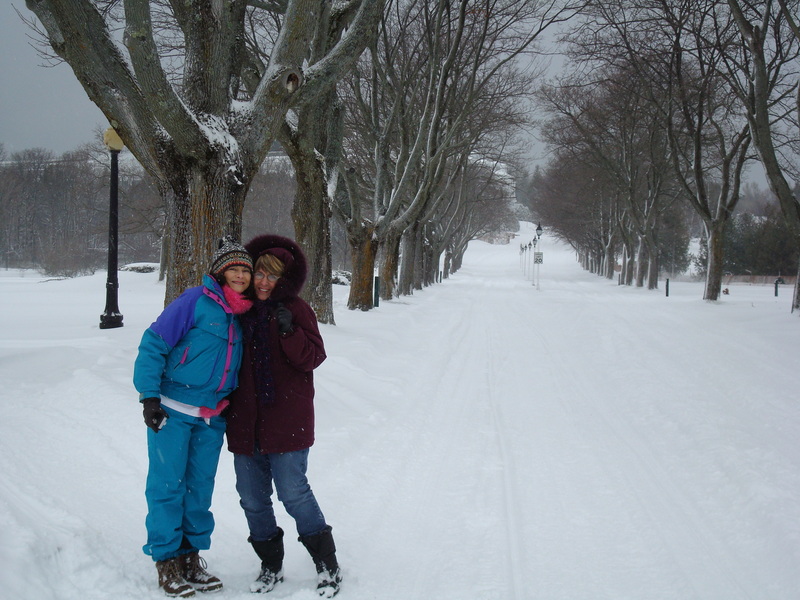 Diane and Bonnie, at the bottom of Cadotte Avenue. Jill - I hope she has runners on those tires. French Lane in the snow. Header: Abandoned bikes sit outside the Mackinac Island Visitors Center. Photograph compliments of Jill Sawatzki. 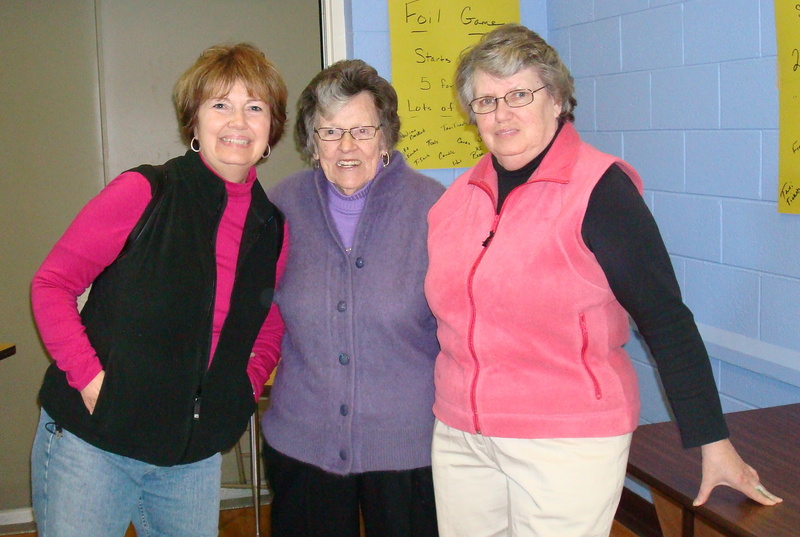 January 20, 2010 Update on Tim Leeper’s ride across the U.S.
January 19: Tim left Clifton at 7:30 this morning, pushing to get to Silver City, NM. It was raining at the start, but by 2 p.m. his time the sun was shining and the rain was about 7 hours behind him. Nonetheless, it was a grueling day for him, climbing 6,400 feet. Four hours later, he just made Silver City, after an 11 hour day on the road. There is snow in Silver City, and the weather looks pretty nasty for the rest of the week. Tomorrow there is a chance he’ll be on a local radio/television show called the Morning Show Live. They’ve been notified he’s coming through, and he’ll call them tomorrow morning and see if they can get him on the air. Tim sounded really tired after a long, tough day. January 20: Tim was interviewed this morning on the Morning Show Live in Silver City NM. It looks like he will be there at least one more day because of the snow. Good chance for him to get a little rest. 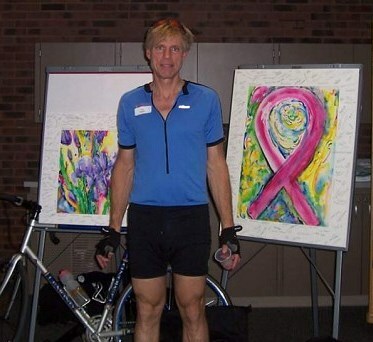 To listen to Tim’s interview, go to http://www.bike4breastcancer.org, click on Pink Ribbon Rides, then click on Meet Tim Leeper. The interview link is there. Do you remember back in September when I was running all over the island trying to find Mike Rowe of the Discovery Channel’s Dirty Jobs? And then I did find him at the airport as he was leaving? Well, almost five months later now, the Discovery Channel will air the episodes filmed during his visit to the island and to the Soo. 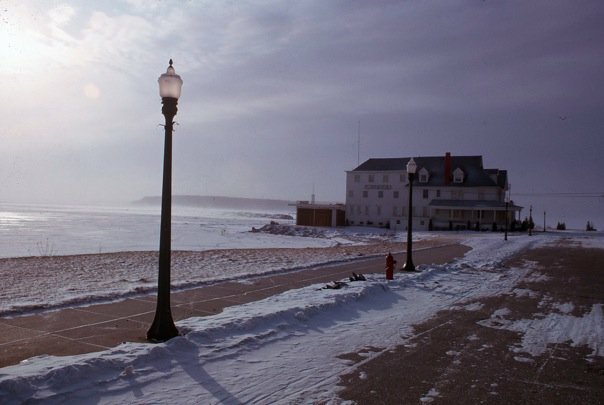 On the January 26 episode, Mike visits the Soo Locks in the UP; on February 9, Mike chats with two of his biggest fans on the Grand Hotel’s front lawn, and on February 23, Mike and his crew have fun with some very dirty jobs on Mackinac Island at Horn’s Bar, Mission Point Resort, the Grand Hotel, and 7th Heaven Salon. You don’t want to miss any of these shows! 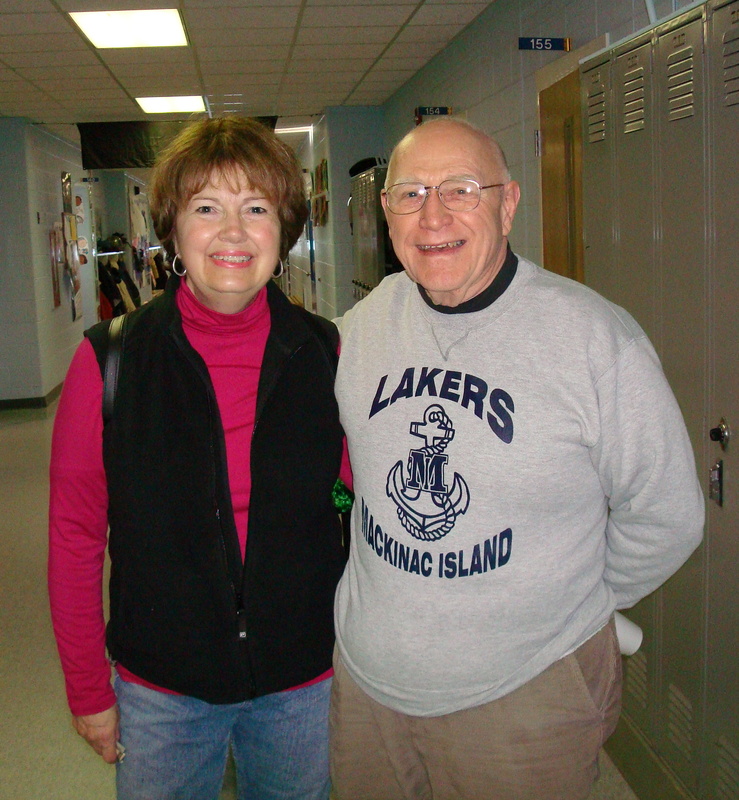 According to Jeannette Doud’s Mackinac Island column in The St. Ignace News, “more than 30 people gathered at Ft. Holmes New Year’s Eve at midnight to watch the new year come in and to view the beautiful blue moon”. The next day temperatures dipped to 10 degrees below zero. 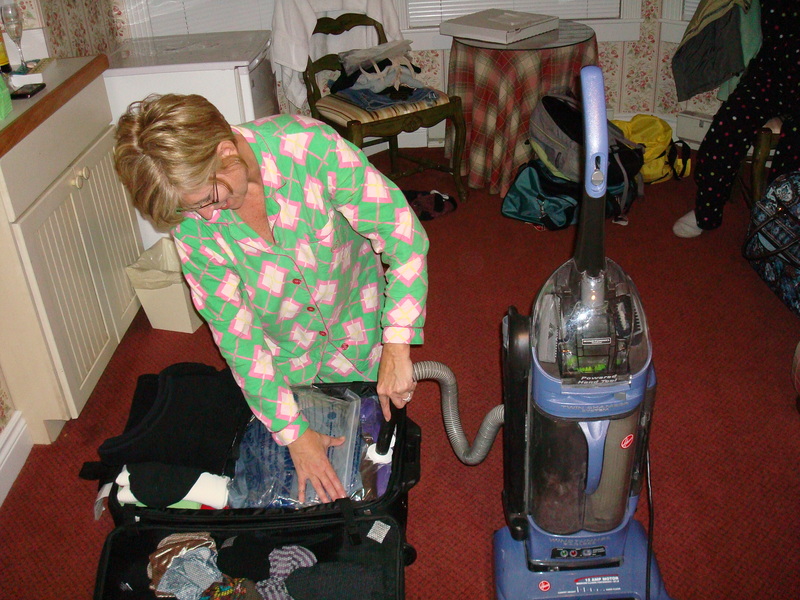 She also reported that “Pontiac Lodge, Bogan Lane Inn, Cottage Inn, Mission Point Resort, and many other rental units were filled for the long weekend”. 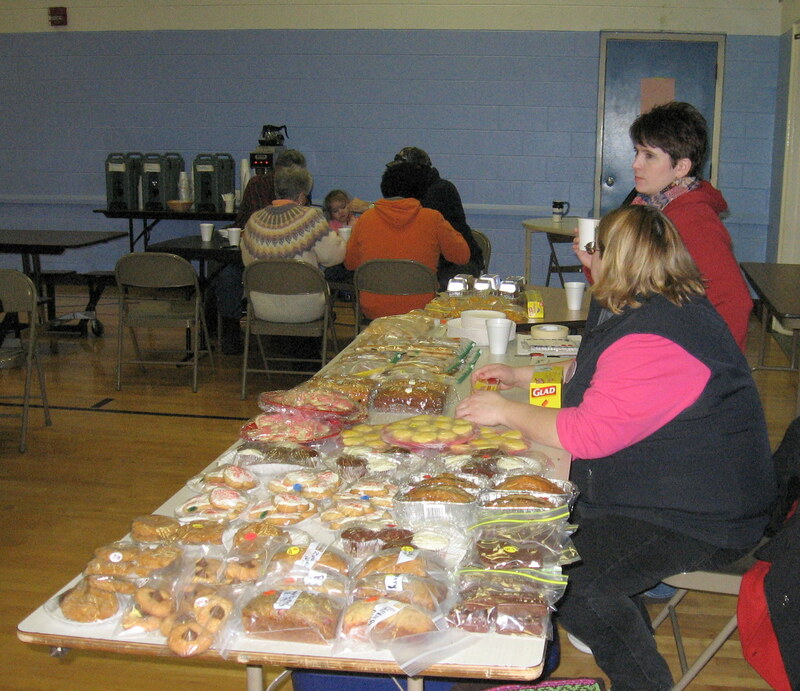 According to Jeannette, the proceeds of the Christmas Bazaar were divided among Ste. 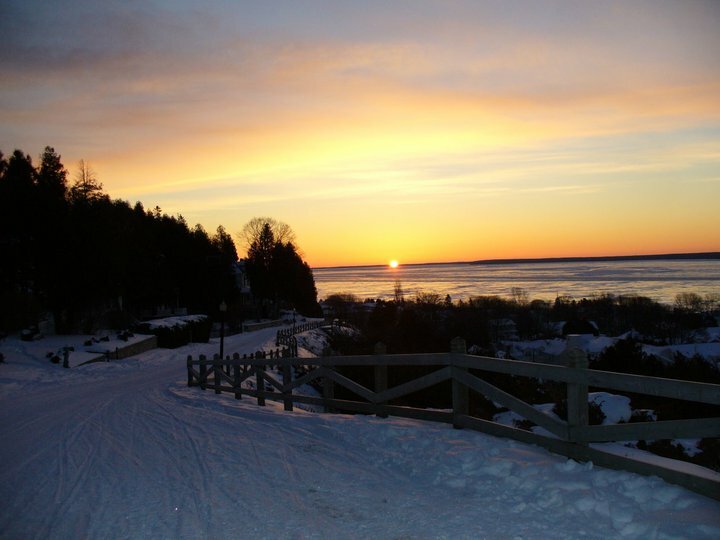 Anne’s, Mackinac Island Bible Church, Trinity Church, Little Stone Church, and the Mackinac Island Medical Center. Each received $8,000! Patrick Sinclair’s Irish Pub will be hosting a Super Bowl Street Party on February 7. 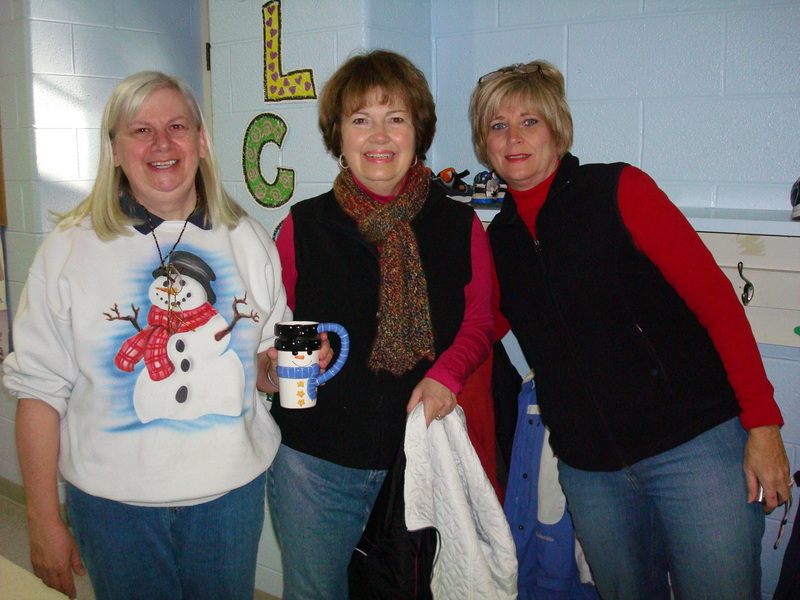 That just happens to be when Dawn, Jill, Mike and I will be there for Winter Festival. You know how excited I am about anything to do with football:), but if that’s where everyone else in town will be that night, we’ll all be there too! 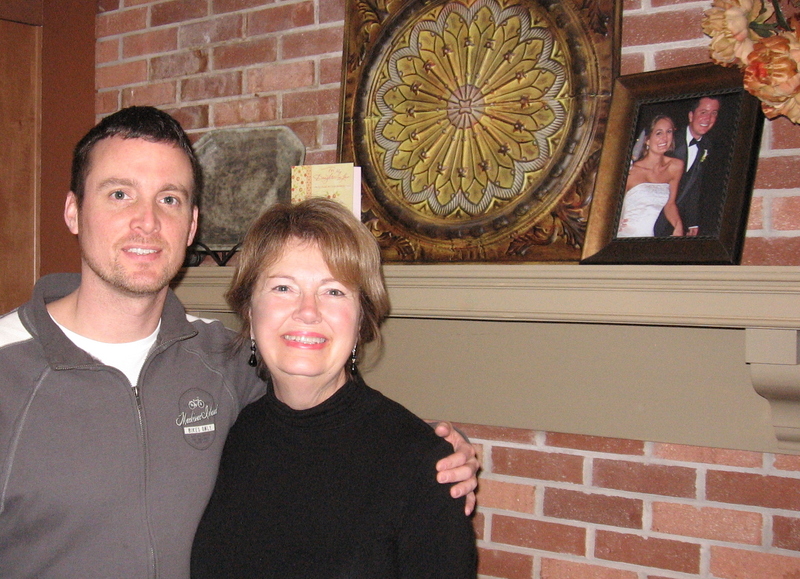 January 14: Tim arrived in Surprise, AZ and spent the night with a good friend, Tracy Kinane, a school teacher. It was a 50-mile trip from Wickenberg – a short day with the wind at his back. January 15: Tim had another good day on the bike, with above average temperatures and lots of sunshine. He was in Apache Junction, AZ for the night. January 16: Tim climbed a total of 4,600 feet today in a little over six hours, ending in Globe AZ, elevation 3,400. He was tired. The roads were narrow and became even more so the higher he climbed, and as he jockeyed for position with vehicular traffic. The weather is still good and the views are amazing. He was shaking when he stopped. Coming back from dinner in Apache Junction last night he had a flat, which he fixed this morning, and then had another flat not long after starting off. January 17: Tim awoke to a flat tire again this morning (Sunday), and about six miles out had another one. He needed to ride 80 miles today to the next town with a motel – Thatcher, AZ – but he had the wind at his back and made good time. The temp was 31 when he started out, ending up at 63 by the time he got to his destination. He went through some poor areas and was chased by three dogs outside one town. They surrounded his bike and stayed with him for a mile. Monday will be a busy day. He has a 2,000 ft. climb, a 1,500 foot drop, then another 3,000 climb to his next destination. There is bad weather coming from the west, and he may be stuck there for a few days as they are predicting 5 ” of rain and 5 feet of snow in the mountains. On the road with Tim - somewhere in the mountains of California. This summer during the Festival of the Horse, I was on a tour of the West Bluff stables, led of Marta Olson. 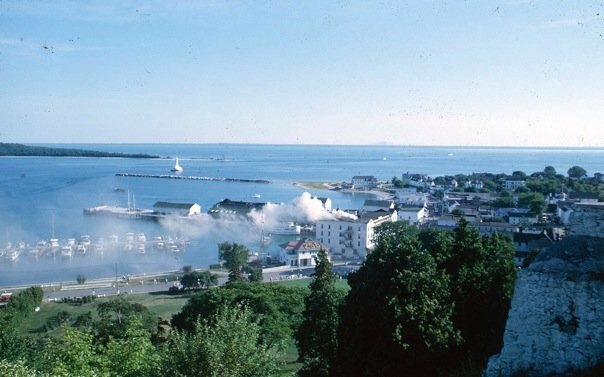 Marta’s father was once the Director of the Mackinac Island Historic Parks, and she has posted some wonderful photographs of the island in the 60’s. I asked her permission to use a few, and she graciously said yes. 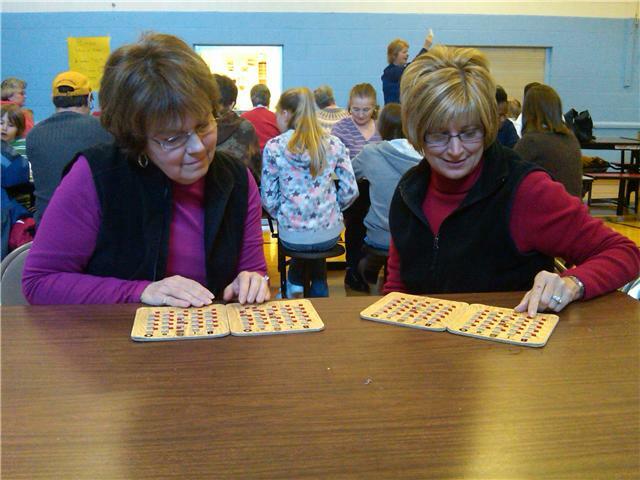 The photos below are used with written permission – copyright Eugene T. Petersen & Marta Olson. 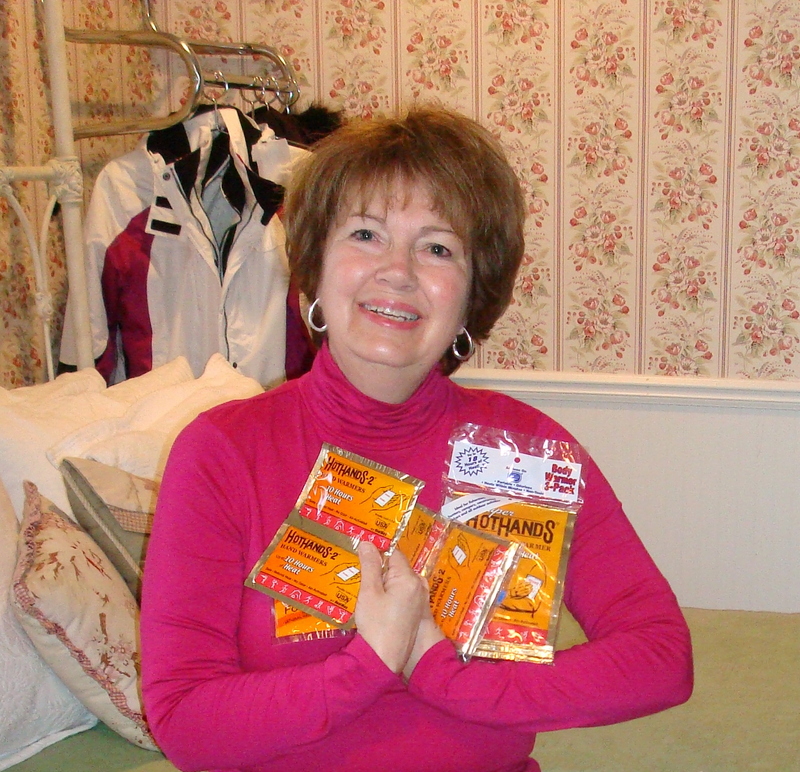 Thanks so much, Marta, for sharing. The Chippewa Hotel on fire - in the 1960's. 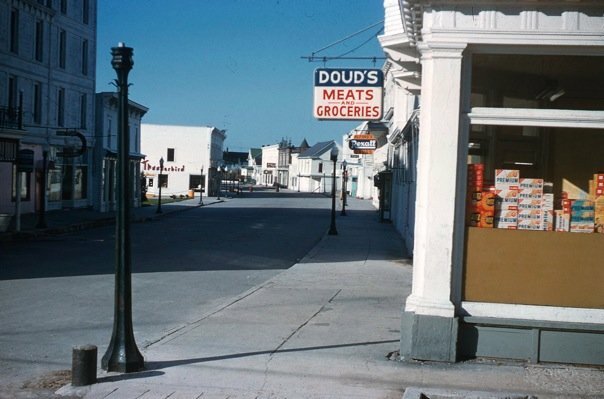 Main Street in the 1960's. This was obviously not on a crowded summer day. Looks like Premium Saltines and Ritz Crackers were popular even back then (Doud's window). The Iroqious Hotel as it stood in the 60's. There was only a lonely stretch of beach leading to it at that time. So stately and so beautiful. 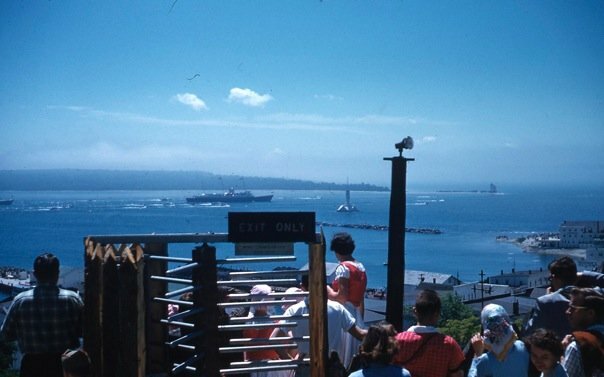 In 1960, people gather to watch as Queen Elizabeth's yacht passes through the Straits. 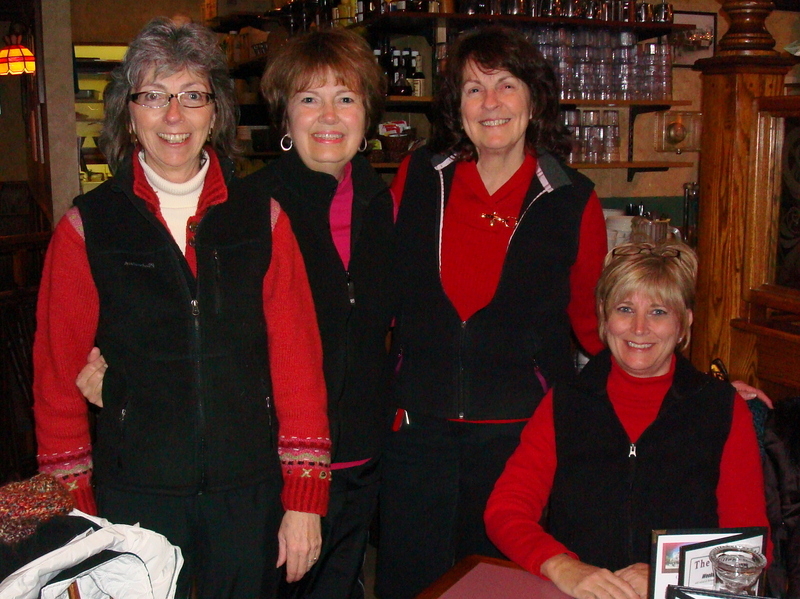 And finally, yes, there is a merry little crew from Georgia traveling to the island for the Winter Festival Feb. 6-7. For that whole story, please click for the Lake Blackshear Blog post, Two Dixie Chicks Go Blizzard Shopping: http://bree1976.wordpress.com/2010/01/12/two-dixie-chicks-go-blizzard-shopping-01122010/. The way things are looking right now we might need our sandals instead of our snow boots, but with 18 days before we leave, we all are praying for more snow on the island and/or at least some pretty cold temperatures. I know that islanders are wishing for that also, as the formation of the ice bridge depends on the cold. Until it forms, islanders are isolated except for a plane ride in or out. I will post more of Tim’s ride to this weekly update as I receive them, so please check back during the week. Jan. 12: Tim spent the night in Salome, AZ. Along the way, he met a gentlemen from northern California who had ridden from Washington to Maine, then down to Florida. He was heading home to California on the same southern tier route Tim is on, having left home originally in June. Tim is collecting al types of souvenirs on his ride and is attaching and displaying them on his bicycle. When Tim got to Salome, the hotel clerk asked him if he had seen the family five on ONE BICYCLE, who had left Kentucky, rode to Florida, and were now on the southern tier route, making their way to Alaska. They had a two-year trip planned. Jan. 13: With the wind at his back for the first time since he started his trip, Tim had a very pleasant day on the road, ending at Wickenburg, AZ. While the mornings have been cool, the days have been in the mid-70’s, with lots of sunshine. He did experience his third flat tire since the beginning of the trip, from a 5″ nail. Wickenburg is the first real town he’s been in since the beginning of his trip, population around 5,000. He was going out for dinner and to walk through their downtown area. He sees he’s heading for some worsening weather conditions – cooler – and hopes to avoid the rain they are forecasting. Jan. 10: Tim rode from Brawley, CA to Palo Verde, CA, which entailed a 1,200 climb plus some “rolling” hills. He was warned that between the two towns there were no services, so he needed to carry and food supplies with him. Jan. 11: Tim continued his ride through the desert, crossing into Arizona and spending the night in Quartzite, a mining town. Phone service is sketchy at best – his cell worked at one end of his hotel room, but not the other (and it wasn’t a very big room). The towns are very small with not much to offer in the way of eateries. Header: Compliments of Jill Sawatzki. Hello, hello, hello! SO good to be back in Georgia! We had the wonderful holiday in Arkansas and New Orleans. We got to play in the SNOW with our grandchildren, eat shrimp po’boys with Cathie and Charlie, and put over 2,000 miles on the new truck (I don’t care if I sit in that truck seat again for quite a while)! 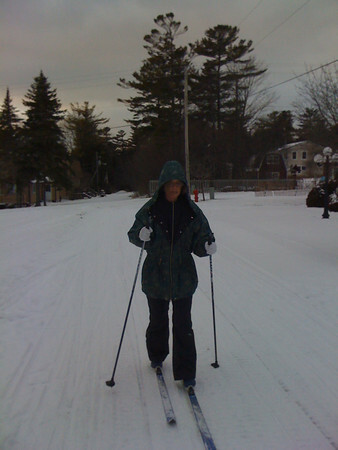 Laurie - cross country skiing in front of the condos. 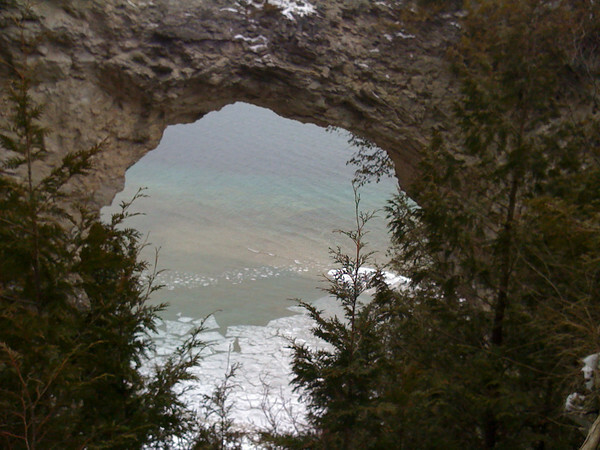 Looking through Arch Rock. Ice can be seen forming at the lake's edge. 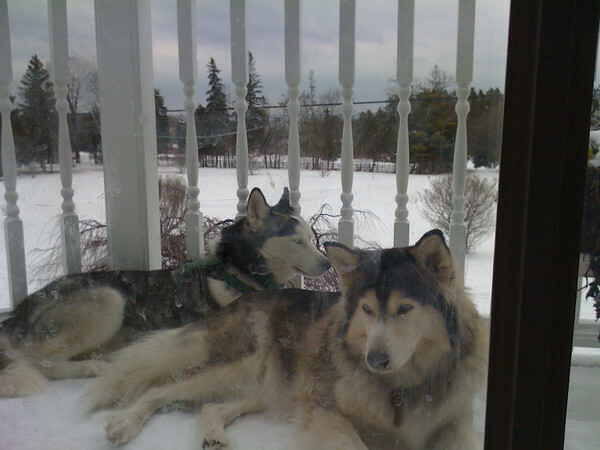 Demon and Miika - out on the deck after a day pulling the sled over the snow-covered trails of the island. Happy girls, happy dogs. Have you ever seen whiter, cleaner snow? Last week the Mackinac Island Fire Department was called upon to help fight a fire in St. Ignace. The fire started in an apartment above a store, and at least two people were inside when the fire started. One man escaped on his own, but firefighters had to rescue a woman, who was transported to the hospital and is ok. The Mackinac Island firefighters were part of five area fire departments who responded to the scene. 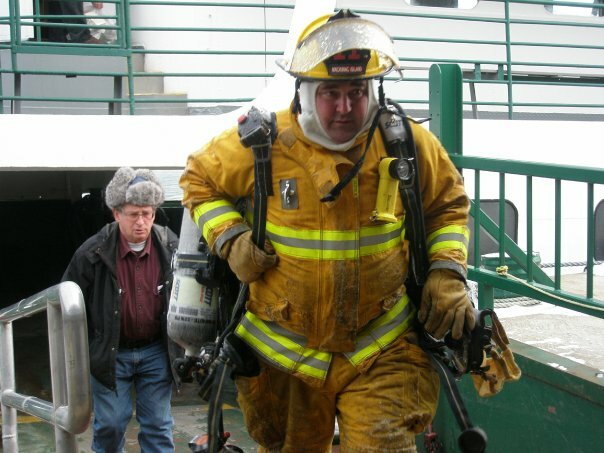 An island firefighter from the first crew sent to St. Ignace returns on the ferry. 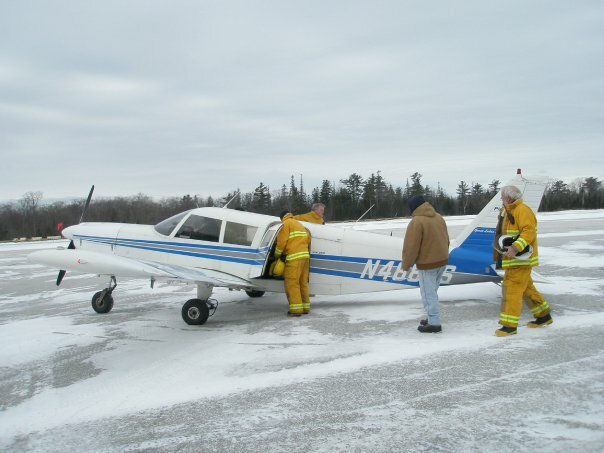 The second crew sent to St. Ignace from the island returns via plane. Arnold Ferry Lines ran the last ferry to the island on Thursday, January 7. 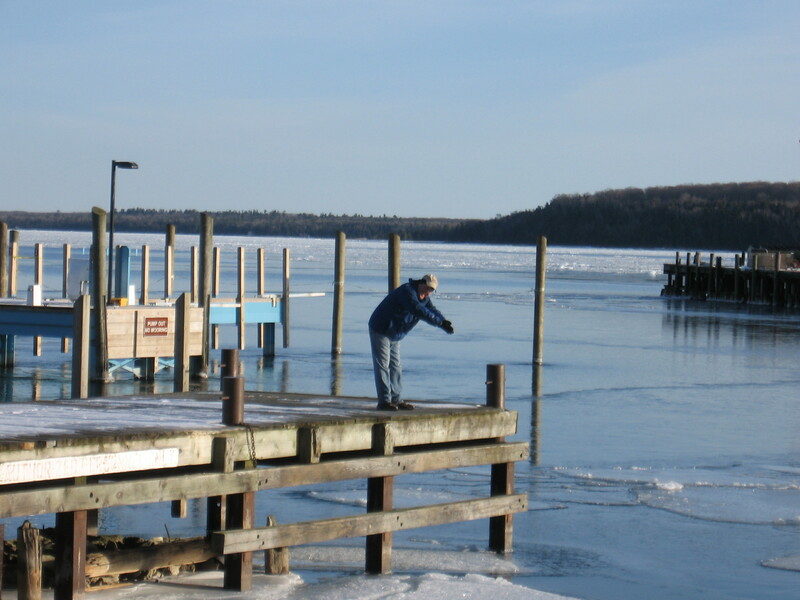 It was the heavy ice build-up in the St. Ignace harbor that caused the shutdown, not ice in the island harbor. With ferry service stopped, and the ice bridge still weeks away (if it forms), the island is now truly shut off from the mainland, except for the daily service by Great Lakes Air. 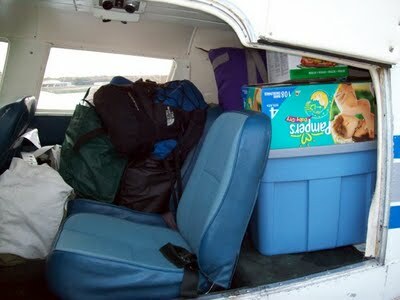 My island friend Liz posted these great shots of the island-hopping airplane on her blog http://quiltedturtle.blogspot.com. The photos were taken in October, which explains why no snow is visible. Liz reports that the plane holds a pilot, five passengers and their baggage. Round-trip fare from St. Ignace to the island is $50. Kids and pets fly free if they sit in your lap. Liz said that when the plane is carrying mail or UPS freight, some or all of the seats are removed (well, they leave the pilot's seat). Freight cost is $2.50 per box or tub. 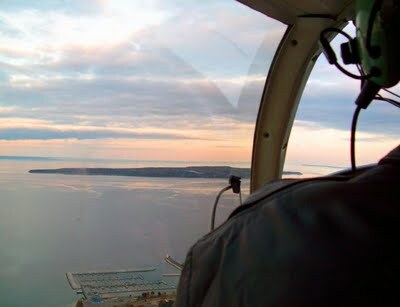 Over the pilot's shoulder is Mackinac Island. 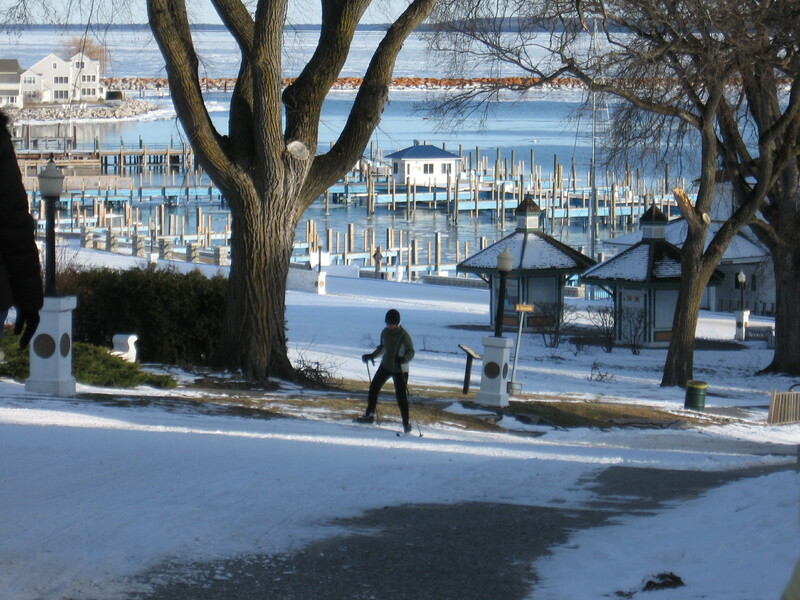 Below on the left is the St. Ignace Marina. The flight is about five minutes in duration. 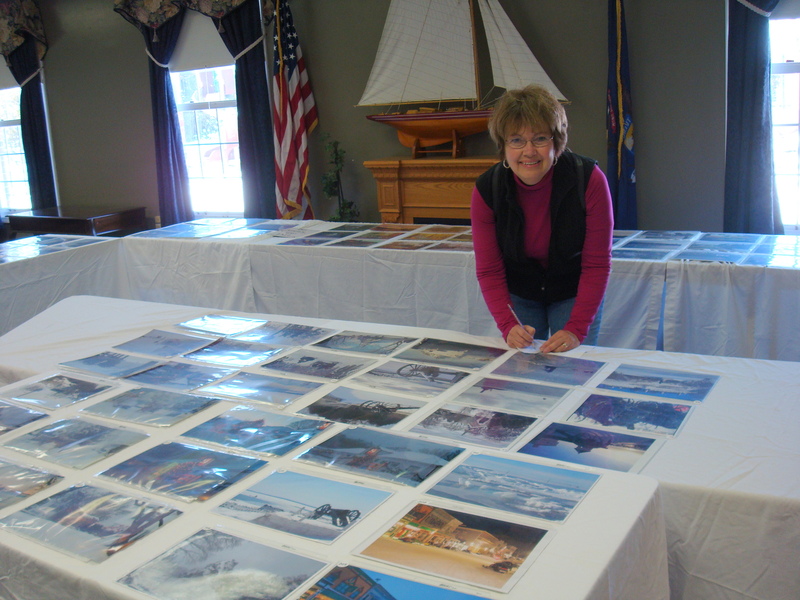 If you’ve ever visited Mackinac Island and took a photograph you think is a winner, you have three more weeks to enter it in the Mackinac Island Recreation Department (MIRD) calendar contest. 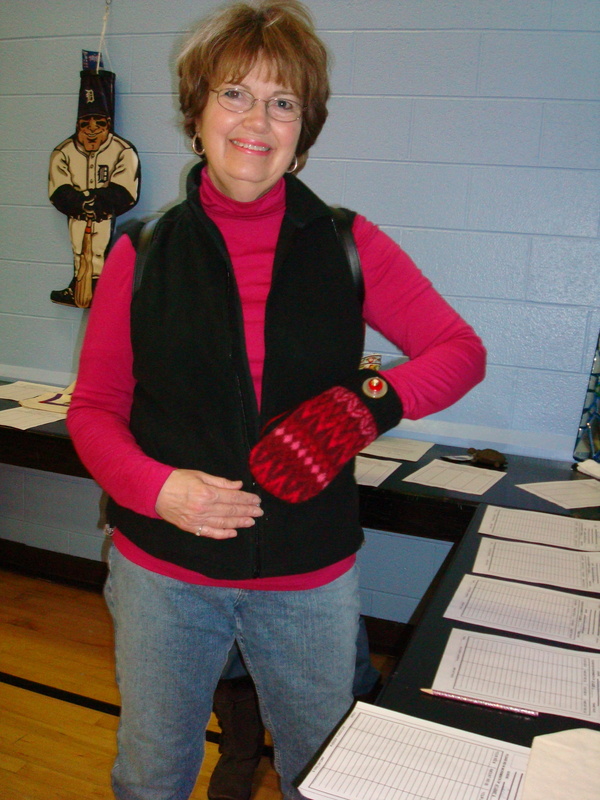 Entries must be received by February 1, 2010. The entry fee is $2.00 per photo. Entries must be submitted horizontal only, 8 x 10 (include the negative/slide/CD). 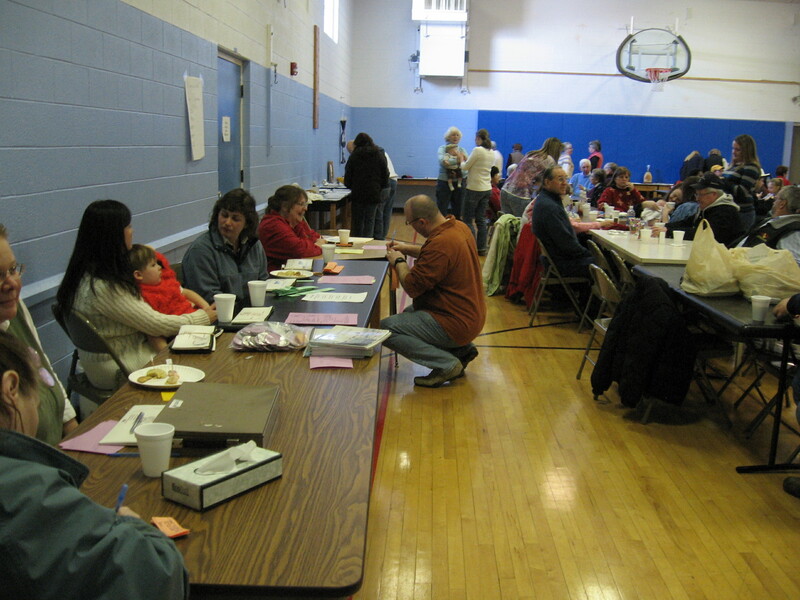 Judging will be at the Winter Festival Feb. 6/7 for the 2012 calendar. 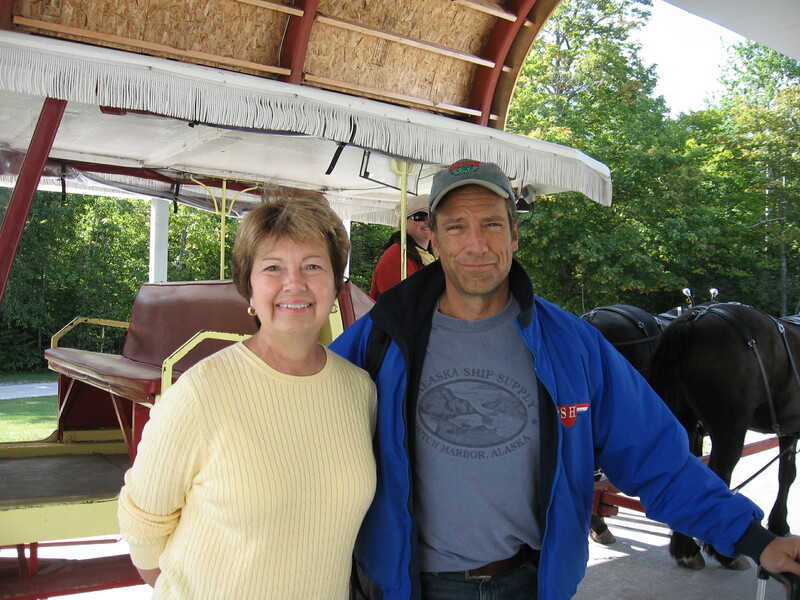 Tim Leeper is a gentlemen Ted and I met on Mackinac Island last summer. He and his daughter Arial attend the Little Stone Church, and it is there we met them. Tim is a widower, who lost his wife Patty 8 years ago to breast cancer. Her cancer was discovered while she was pregnant with Arial, and she fought for 11 years before losing her battle. One of the goals Tim and Patty set was a bike ride across the United States the year Arial would go off to college. Tim is an avid cyclist, and they were either going to ride in tandem or Patty would back Tim up for his ride by following him in a van. Arial received a scholarship this year from the Little Stone Church, and is presently a freshman at a college in Michigan. 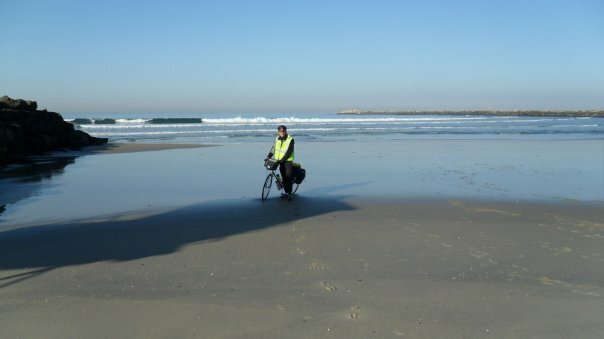 On January 7, Tim dipped the back tire of his bicycle in the Pacific Ocean and embarked on the 3,200 mile ride he and Patty had planned to do together. Tim has raised $5,000 already by selling his personal art. He is also seeking sponsorship by the mile for his ride. Proceeds will go to breast cancer awareness in Charlevoix/Emmet Counties in Michigan. He is riding solo and is carrying 38 lbs.of gear with him on the bike. Tim Leeper, with some of his art work. Jan. 8: Another 2,000 ft. climb through five mountain peaks. Has met many great folks along the way already, including a bike shop crew who got his bike ready for the climbs. 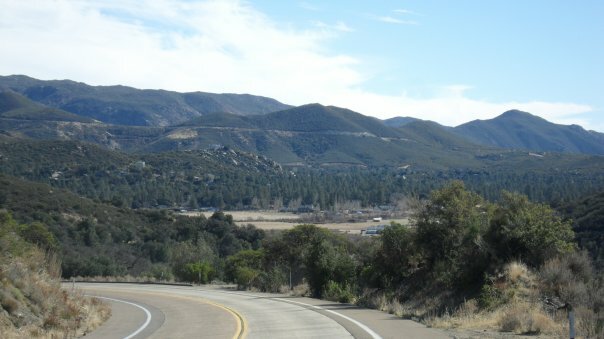 Spent night in Jacumba, CA. 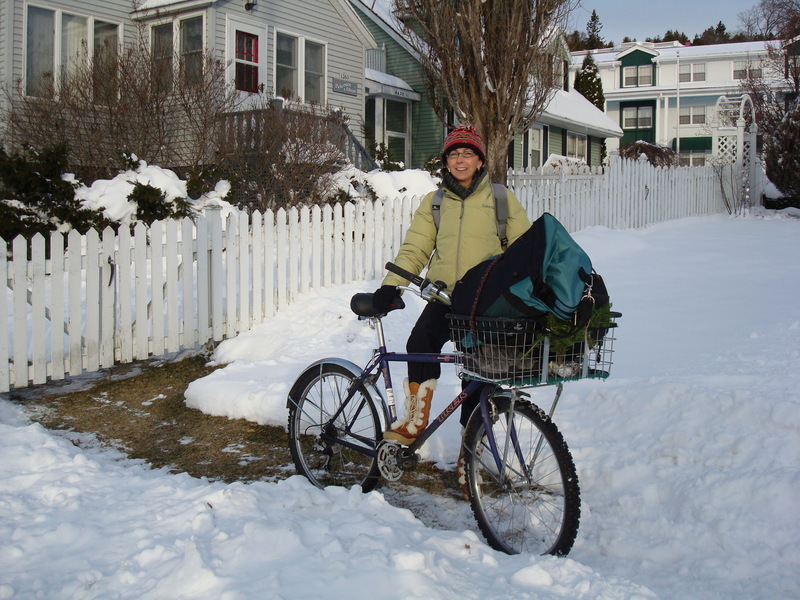 Jan. 9: Tim left in 30 degree weather and rode to Brawley, with the wind in his face all day. He had a 3,000 foot drop over ten miles along I-8, with his hands working the brakes the entire 10 miles. He is averaging 60-70 miles a day, knowing these first legs will be slower because of the mountains. Jan. 10: Planning to travel only 70 miles on Sunday and stay the night in Palo Verde, CA. 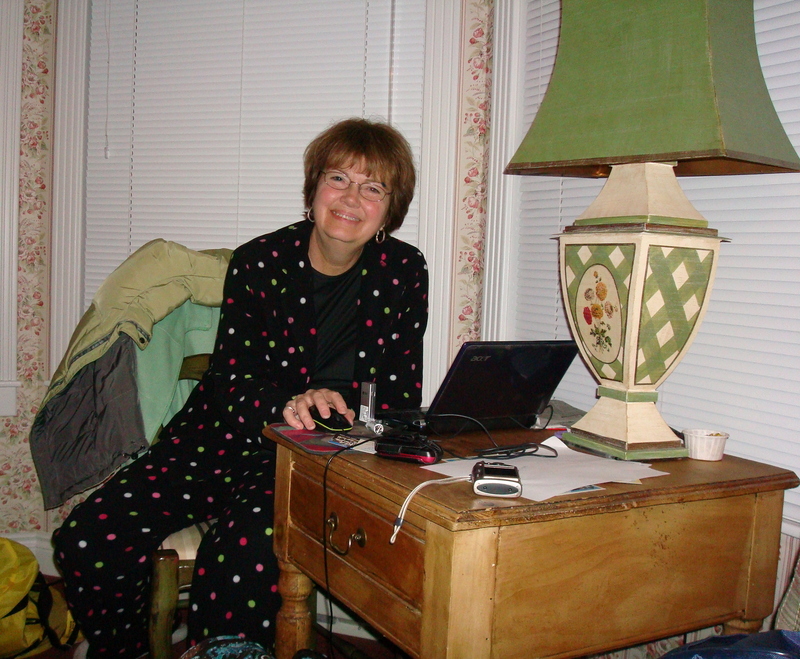 It’s official – On February 4, Dawn (a friend from the lake), Mike Forrester (a friend from Atlanta who also blogs on Mackinac Island), and I will board a flight from Atlanta to Flint, Michigan. 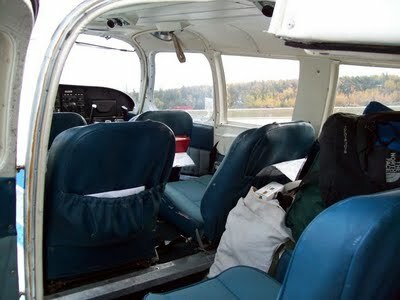 Jill will meet us at the airport in Flint, and from there we will drive to St. Ignace and catch the commuter plane (see above pic) to the island. I’ll write more about our upcoming trip next week. But, suffice it to say, we are EXCITED beyond words! Please check back in a few days for more updates from Tim Leeper. God bless.